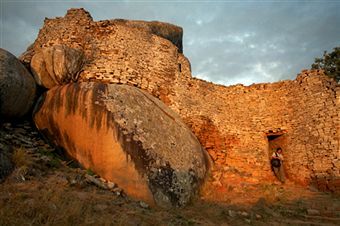 Ghosts and Zimbabwe: Ancient City of Great Zimbabwe. I believe but that is only because I have had several very different experiences, the most recent while visiting the ancient city of Great Zimbabwe in Oct 2006. Our tour guide had taken the group down to the Museum but I remained behind walking around on my own within those ancient granite walls when I realised I was being followed. I then noticed that on the other side of a low wall there were four young teenage boys with dreadlocks and, wearing only groin skins, crouched down and moving along on the other side of the wall to keeping up with me. My immediate reaction, unaware they were spirits, was to greet them and that is when I also noticed the long dry grass in which they were moving was bending over. When I looked back at them say "Hello" again, they were not there. And afterwards I realised there was no long grass either. I understand that ghosts do exist, but in another dimension and it is only when we are least expecting it we might have the privilege to see or experience their presence. I immediately left the Monument and went down to see our tour guide but was quite deflated when he told me I was not the only one to have seen ghosts at the Ancient City of Great Zimbabwe. Do you dare to visit a place which needs a lot guts to take a trip to? If you wish to take flights to Zimbabwe and desire for a spooky place, do go for it and test do you get scared or not!